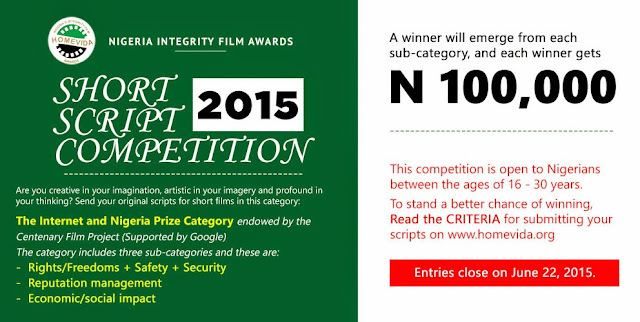 Win N100, 000 and have your winning scripts turned into short films in the Homevida 2015 Call for Scripts Competition. ‘The Internet and Nigeria’ Prize Category. A winner will emerge from each sub-category. Able to fit into a 10-15 minutes short film. Scripts should be no more than 15 pages. Typed and presented professionally in MS Word or PDF. Entries close Monday June 22nd, 2015. HomeVida is an initiative of the Public and Private Development Centre (PPDC). This initiative was created as a platform to drive creative messaging on integrity and value change by providing incentives to script writers and film makers who consider such values in their work. For your viewing pleasure, watch the short film that won the Human Development Film Prize Category in the 2013 Short Scripts Competition.